QSC Digital Cinema Monitors integrate DSP crossovers, booth monitoring, and load fault detection into a single unit providing exceptional performance and control while interfacing seamlessly with existing legacy cinema processors. Designed to be used preferably with QSCs Digital Cinema Amplifiers (DCAs or ISAs), DCMs optimize loudspeaker performance while simplifying cinema sound system wiring and configuration. 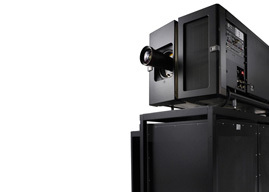 The DCM-10D and DCM-30D cover cinema systems ranging from three to five screen channels, and are configurable for bi-amp, tri-amp or quad-amp operation. DCMs are also compatible with all cinema processor formats including Dolby Digital Surround-EX and DTS-ES.